Emojis are small digital images or icons used to express an idea, emotion, etc., in electronic communication. What is the CARmojis app, why did C.A.R. make it, and why would you use it? Communicating face-to-face involves the use of non-verbal tools like: intonation, gestures, facial expressions, and body language. 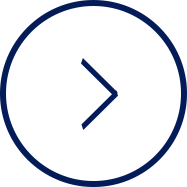 Electronic communication lacks these tools so we can use emojis as a tool to help us more accurately convey the message we want others to receive. Anyone with access to the Google Play Store or Apple App Store can download the app, but it was created for use by members of the CALIFORNIA ASSOCIATION OF REALTORS® as a free member benefit for use by California REALTORS®. 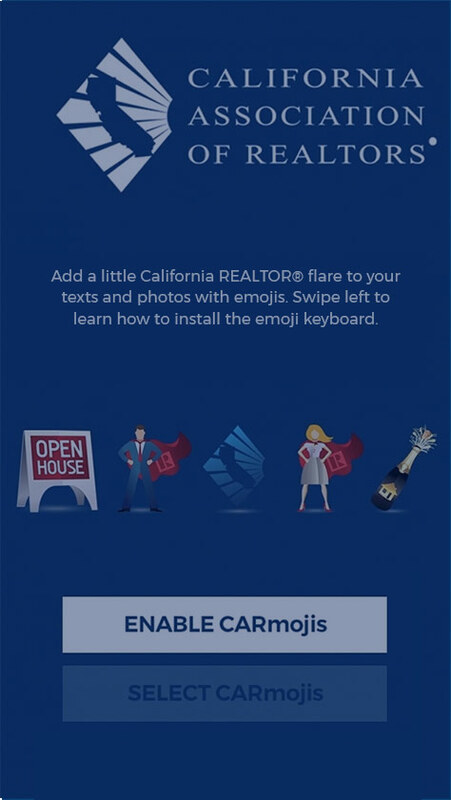 Can anyone download the CARmojis app, even if you aren’t a REALTOR®? Yes. The CARmojis app is available in the Apple App Store or Google Play store for anyone to download. Why don’t these images work exactly like the emojis in your standard emoji keyboard? CARmojis “emojis” are technically graphics. Apple and Google do not give access to code these like conventional emojis; however, most people will refer to them as emojis. The word emoji is shorthand for a picture that people use in text messaging. The CARmojis Keyboard works on messaging platforms in which users can copy and paste graphics or images. Can you use the emojis on Facebook, Instagram and Twitter? No. The keyboard will work on social-messaging platforms in which you can copy and paste graphics or images. That means you can reach your audience on Mail, iMessage, Kik, WhatsApp, Tango and most third-party text messaging apps — a network that has more than two billion monthly active users. However, CARmojis Keyboard doesn’t work on broadcasting apps like Instagram and Twitter because those platforms don’t allow the functionality. Does the keyboard work on all cell phones? CARmojis work on iOS and Android smartphones in messaging apps that support copying and pasting. Unfortunately, some older Android devices do not support third party keyboards in their native messaging apps. iOS 8.0 or later is required on Apple devices. Why do CARmojis require Full Access? “Full Access” is required by all 3rd party keyboards in order to work within the iOS environment, this is not a requirement specific to the CARmojis Keyboard. We keep track, for reporting purposes, of which CARmojis are searched for and shared within the keyboard on aggregate, not against individuals. We do not track or store the text of the message sent with the CARmojis. Can you send CARmojis to people who don’t have the app installed? Yes, the app is only required to send, not to receive. How do you download the CARmojis app? 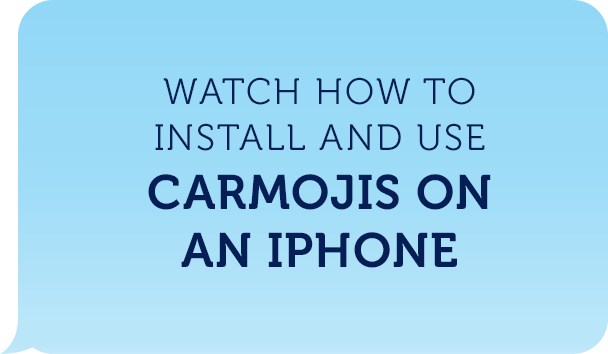 Go to the App Store from your iPhone or iPad and search for CARmojis. Click the “Get” button on the page and the app will begin to download. How do you install the CARmojis keyboard after you download the app? After downloading the app from the App Store, click on the app icon on your home screen to open. From there follow the directions in the app to install the keyboard. Can you send CARmojis from iPhone to Android? Yes. The emojis can be sent from iPhone to Android without any problems. 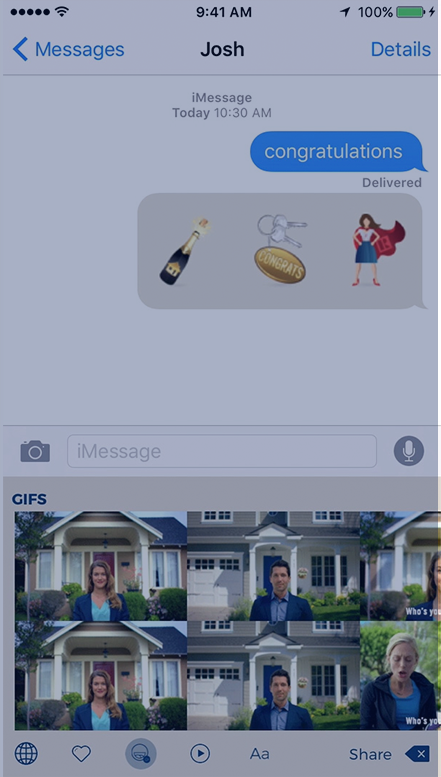 How do you access the CARmojis Keyboard once you open an iMessage? To access CARmojis either click or hold down the small globe button in the bottom left hand corner of your keyboard screen. How do you go back and forth between the CARmojis keyboard and standard keyboard? In order to go back and forth between CARmojis and the standard keyboard, click or hold down the small globe icon in the bottom left hand corner of your screen. Press and hold the globe icon and a pop-up with all your keyboards will appear. Select the C.A.R. emojis and stickers keyboard to begin. The globe icon cycles through all 3rd party keyboards. From your Android device access the Google Play store. Once in the store search for CARmojis and then click “Install” and the app will begin to download. After downloading the app from Google Play, click on the app icon on your home screen to load the app. From there, follow the directions in the app to install the keyboard. 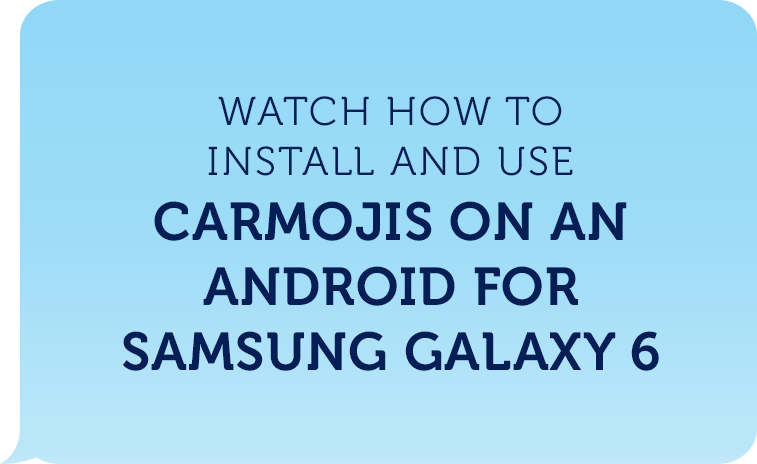 Can you send CARmojis from Android to iPhone? This depends on the messaging app you are using to send the CARmoji. Unfortunately, many messaging apps on Android will code the image in a way that’s not readable on iOS devices, in these cases it is best to send the CARmoji by email to ensure delivery on iOS. How do you go back and forth between the CARmojis keyboard and the standard Android keyboard? This depends on the version of Android you have installed and the keyboard you are using. Please consult your device’s User Manual which can typically be found in your Settings. Some keyboards will let you long-click the spacebar to switch keyboards. Other versions will show a small keyboard icon on the screen whenever a keyboard is open. To change keyboards, simply tap that icon and choose from the list. On some other versions that do not display the keyboard icon, go to your phone’s settings and find Language & Input (sometimes this is under the System section or the Personal section). Once you click into Language & Input, scroll to Keyboards and then select the one you want. How do you access the CARmojis Keyboard? Open any app on your phone that uses a keyboard, follow the instructions above to change your keyboard to CARmojis. Click on the CARmoji(s) you want to share, then choose the messaging app you wish to use, and enter the recipient(s).